When a problem is initially stated, everyone assumes they understand it in the same way. That might be false because we tend to unconsciously fill the gaps with our own projections, and colour in the words with our own point of view. If we do not realise that we are misaligned this might result in wasted hours, inefficient suggestions and frustration on all sides. The client might feel we do not understand the subject or their situation. We might feel frustrated as well because our good advice gets ignored. My aim for this article is to show how we can be more effective and intentional with our questions. With our questions we can move the other’s attention into the big picture, abstract concepts and motivations. Moving in the opposite direction helps to focus on details and concrete facts. Some people like to visualise it as zoom levels, others as an up and downward movement. Some people are most happy when they have their teeth deep into the details. It might be useful for them to move up for a moment to see the bigger picture of their challenge. We want to know if we are digging in the right place, before we help them digging faster and deeper. It’s easier to agree on an abstract level. This makes it a useful direction to navigate to in conflicts. Most people will agree that ‘life quality’ is very aspirational, while different people have different ideas about what this means to them and how it is best realised. By moving attention upwards we can help all parties to recognise that their conflicting parts ultimately follow the same intention. It may stop feeling like a conflict or they might be able to find a third solution. From there both parties can move back down into a more concrete solution together. Moving up tends to appeal to our values and will motivate us. When the communication is vague, high level, words can mean different things to different people. Here it is useful to clarify by moving down to a more specific level, fill in the missing gaps in the picture, before starting any work. ‘Could you give me an example? We want to be mindful that this kind of inquiry might easily come across as an interrogation. Sincere and humble asking and an occasional softening phrase might slow your inquiry down to a comfortable pace. As softening phrases you might add things like ‘Out of curiosity...’, ‘I was wondering...’. Be mindful that we are communicating beyond mere words. We tend to be less aware of this, but our thinking and emotions get passed by our body language, voice tone, speed, breaks to listen as well. If you are not sincere in your inquiry people will feel it immediately. The more you go into detail, the more there is to disagree about. Two people might be in agreement that both love football, but if you get them talking which club they support there is plenty to disagree about. If the conversation is focusing too much on obstacles, with too specific details, people might feel overwhelmed, pressured and choose to disagree. Remembering the model you can move back up to the last level you agreed on, do more asking and build more trust before moving back down into more concrete solutions together. Everybody has a preferred attention direction that guides their curiosity. It is very useful to build an awareness of your own and the others’ preference [big picture/details]. If you find you have different preferences, then matching the other person's preference initially is a strategy for gaining trust before starting to take a lead and move attention up or down with your questions. 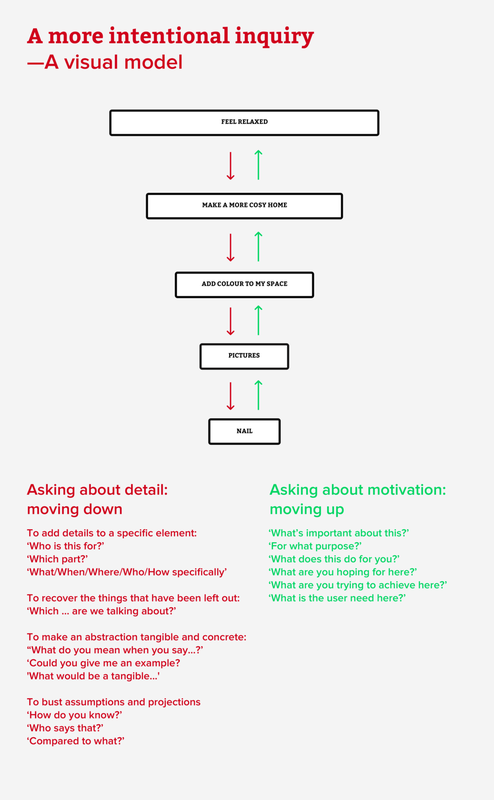 Visualising the question model is a great help for me to ask better questions. I ask myself ‘What else needs to happen here?’, ‘What will be most helpful now?’, ‘What could be keeping the client from moving ahead?’ and try to steer the conversation along these lines. In your next meeting try to move the attention direction up and down intentionally. Document the directions of all questions. When did you go up into motivations or down into detail? Think about what these questions started to illuminate. Can you identify any patterns? I am curious to hear about your best questions and ways of inquiry.